Ultimate Ears have came up with a bigger and meaner portable speaker in the form of the UE Megaboom. Improving on what was already a great portable bluetooth speaker, the Megaboom retains many of the original plus points, and even offers richer and louder sound than its smaller brother. It’s a highly portable speaker, build to handle the sun, the sand and the sea, thanks to the waterproof and hardened speaker shell. Placement is also highly flexible, thanks to the 360 degree sound. I prefer to leave it standing up, but you can lay it down too, although there’s a tendency for it to roll when placed in the laid down orientation. I was impressed with the UE Boom, which stood out in the field of portable bluetooth speakers, and the Megaboom is well, bigger, louder, and importantly, better sounding than the original version. It also happens to be more expensive too. Weighing in at just under a kilogram, 8.9 inches tall, and 3.25 inches wide, the UE Megaboom is beefier than it’s predecessor. It features the same smart cylindrical shape for 360 all round reach, but also with useful improvements such as full IPX7 certification. Once you pop in the rubber door seal on the USB charge port and the 3.5 mm jack, it’s conveniently waterproof and you can bring it to the pool, tub, shower, dance class, for good audio coverage. However, the increased heft makes it less portable. Where the previous UE Boom was slim enough to fit in a bottle holder slot at the side of a bag, good luck trying to squeeze the UE Megaboom into the same space. A full charge on the battery earns you a claimed 20 hours of use. And on the review unit, personally, it felt like it lasted much longer. Perhaps because I was playing it at low volume settings. Charging is easy and convenient with any micro USB charger. Software wise, it’s very similar to the UE Boom, although it has its own standalone app. the UE Megaboom employs Bluetooth Smart, which allows you to turn the speaker on and off remotely from the associated UE app. With the app, you can also toggle to pair tow Megabooms together, or even pair the Megaboom with the original Boom, for wider coverage and stereo sound. Rechargeable Lithium-Ion Battery for up to 20 hours of battery life between Micro USB charges. Pair up to 8 Bluetooth enabled source devices — Connect up to two source devices at the same time. Wirelessly play (stream) to 2 UE MEGABOOMs from one source. Mobile range of play is up to 30m (100 ft). NFC (passive) enabled — (works with active NFC enabled source devices Android Jellybean and higher). One issue is the impossible task to expand the sound stage for a single speaker source. As above, that’s where the “Double Up” feature comes in, which lets you join a pair of Booms or Megabooms, running them either as two synced stereo speakers, or as a true stereo pair with one playing the left channel and the other playing the right. However, for that price, there are many alternative choices. 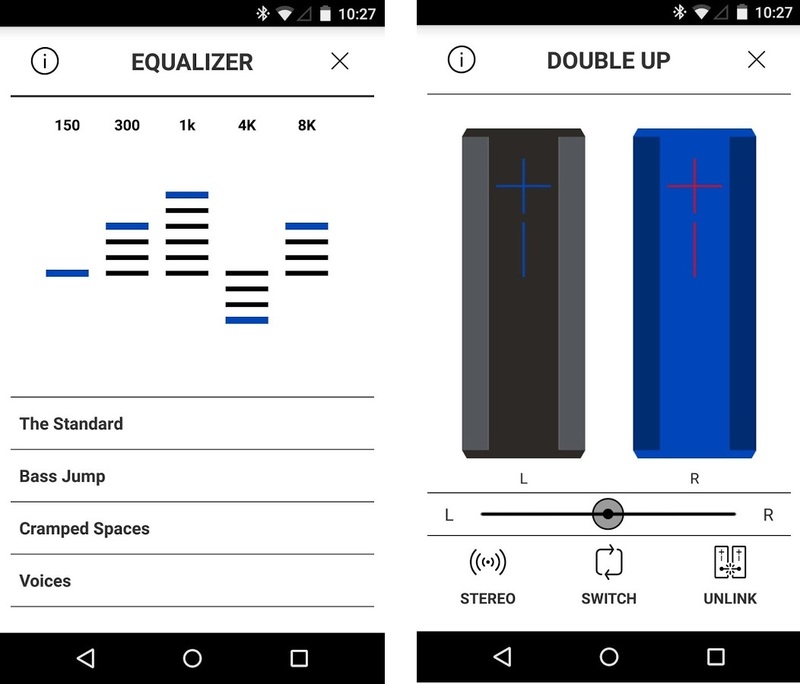 The app comes with an equaliser for you to tweak the sound to your listening preference. The UE Megaboom has a smart waterproof design, excellent battery life, and is damn good at what it needs to do. However, at just under a kilogram, it’s not too fun to lug it around and there are more portable bluetooth options, which are cheaper too. While it is a good portable speaker, it’s probably not the one for you to keep at home to enjoy your favourite tunes. The UE Megaboom is first and foremost a rugged and loud party speaker, and not catered towards audiophiles. If you want to listen in an environment such as partying with friends at the beach, or having a party, the Megaboom is brilliant. That is, if you are willing to part close to $400 on this speaker. The UE Megaboom is available in your usual retail stores, and Apple Online Singapore. Pricing seems to be controlled at the RRP of $399. I would suggest to buy it from Lazada, as the price is a little lower at $375, and you can further use coupons or credit card promotions to bring down the price.